MOBILE, Ala. (AP) — John Cominsky has more people watching Senior Bowl practices this week than he figures would typically attend his games at Division II Charleston. While the Senior Bowl rosters are littered with players from Power 5 schools as usual — some of whom are already household names among college and NFL fans — there’s plenty of others looking to make an impression. That includes small-school stars who caught the attention of NFL teams while playing in front of small crowds away from the glamour of major college football. Saturday’s Senior Bowl will be the first nationally televised games for some. 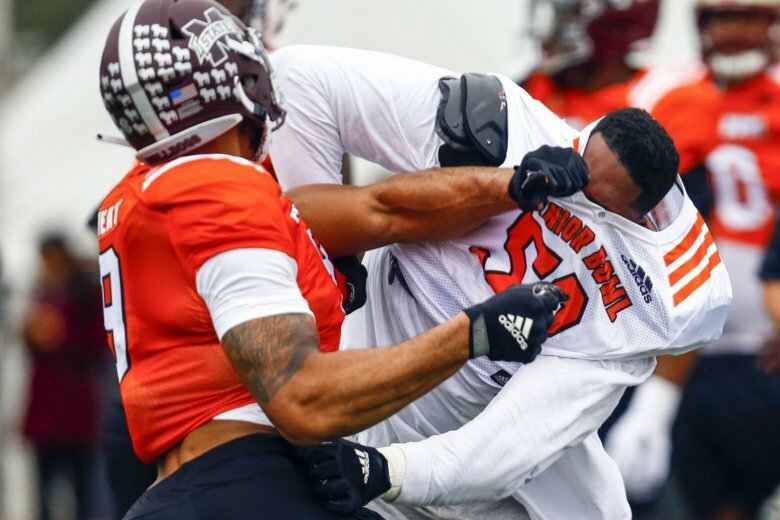 Players like Cominsky, Delaware cornerback Nasir Adderley and high school quarterback-turned left tackle Tytus Howard of Alabama State are competing against their big-school counterparts all week in front of NFL scouts, coaches and executives. Oakland Raiders coach Jon Gruden, who’s leading the North team, can relate to them somewhat as a product of the University of Dayton. All told, the Senior Bowl rosters include 11 FCS players and three from Division II, including Cominsky. He arrived at Charleston as a 215-pound quarterback but measured in this week at 6-foot-5, 285 pounds. Now, NFL teams are getting a chance to see how he fares against bigger, stronger, faster blockers than he typically faced. Gruden said small college products like wide receivers Keelan Doss (UC Davis) and Penny Hart (Georgia State) helped themselves in Wednesday’s practice, and also cited Cominsky. The practice was moved to South Alabama’s indoor facility because of the weather. “This Cominsky kid is also making people check the rosters to see who he is,” Gruden said. — Khalen Saunders, DT, Western Illinois: Missed the birth of daughter Kambridge Vonyea Saunders Tuesday to pursue his NFL dream in Mobile. “There’s no doubt if I love the game or not,” he said. The 6-foot, 320-pounder gained some attention for backflips and even caught a touchdown pass his senior season in addition to his defensive performance. He received scholarship offers from Wisconsin, Notre Dame, Auburn and Missouri out of high school — as a shot putter. — Andy Isabella, WR, UMass: Not an FCS product, but one who’s still from a lower profile program. One of three finalists for the Biletnikoff Award as the nation’s top receiver. Second-team Associated Press All-American after leading the FBS with 1,698 yards on 102 catches. How’d he fare against Power 5 teams? His resume includes a 219-yard performance against Georgia. Isabella also had 303 yards against Liberty, the most of any FBS or FCS receiver in a game on the season. — Adderley. He has drawn NFL buzz leading up to Senior Bowl week for his own play. His pedigree is impressive, too. His grandfather’s cousin, Herb Adderley, played for Vince Lombardi with the Green Bay Packers, and for the Dallas Cowboys, winning three Super Bowls. He was inducted into the Pro Football Hall of Fame in 1980. — Howard. He didn’t get a scholarship offer coming out of high school, where he played quarterback and says he could throw the ball 70 yards. He walked on at Alabama State as a 225-pound tight end. Now, Howard is a 6-5, 322-pounder. Howard never played tight end at the Southwestern Athletic Conference school but did catch a pass on a trick play against Grambling State as a junior. Howard is already lobbying for more chances for himself and his fellow linemen. “You’ve got tackles who can catch the ball so why not use them?” he said. “Nobody’s looking for it. It’s his blocking that could land him an NFL job, though. Senior Bowl head Jim Nagy said none of the players were token small-school invites. “I think every (small college) guy we brought in is going to get drafted and play a long time,” Nagy said.